The chocolate brown speckles on the diminutive quail eggs bring a vision of farm fields and simple life. I seem to breathe a relaxing sigh just looking at each one's unique spattered design. It almost seems that if you cracked one open you'd find rich dark chocolate inside....hmmm.....now there is an idea! Last year I filled chicken eggs with chocolate for an Easter treat. I colored the hollow eggs and filled them with a glossy dark chocolate. 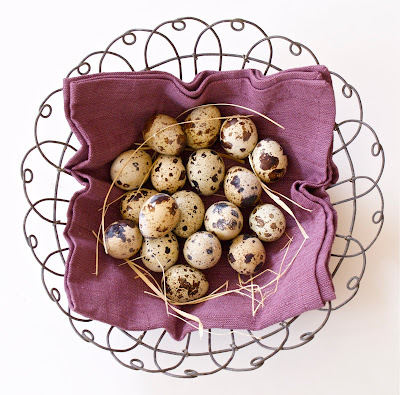 The smaller quail eggs with their natural design make the filled eggs bite size. 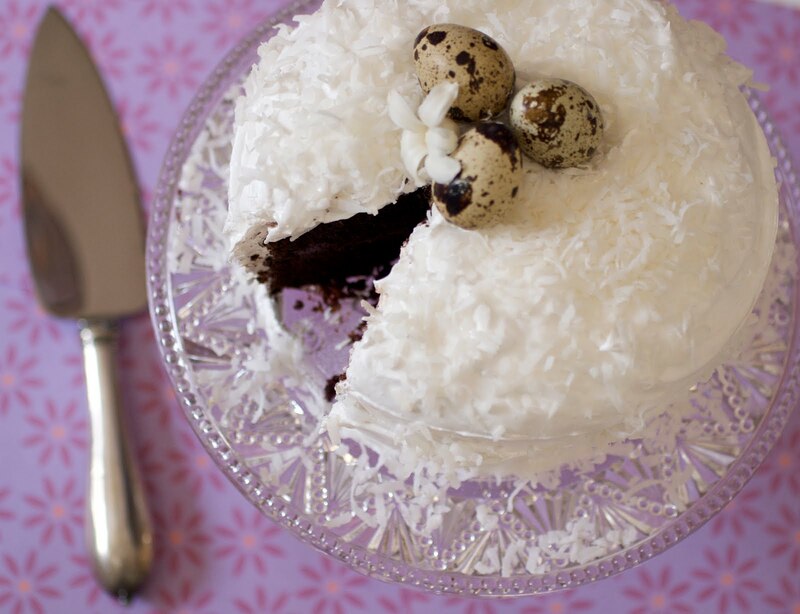 I made a 6 inch round chocolate cake with a filling of almond chocolate ganache, meringue frosting and a light coating of coconut, for the trio of quail eggs to sit upon. 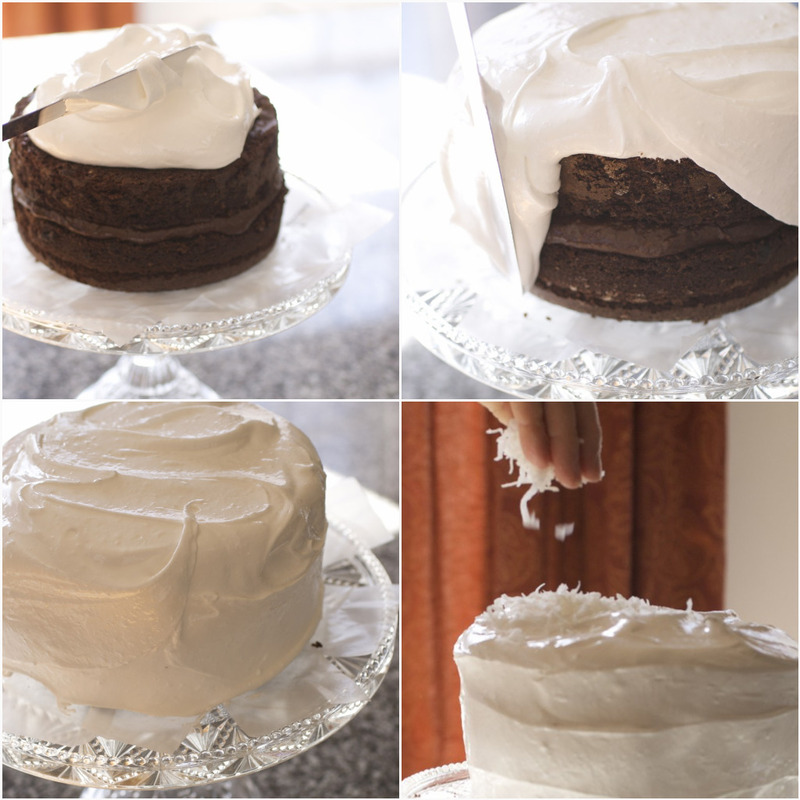 The delicate chocolate cake with the almond chocolate ganache surprise center, partners well with the fluffy meringue frosting. 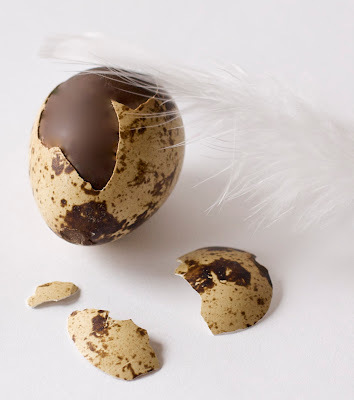 Make plenty of the filled quail eggs full of your favorite chocolate. I used Godiva cinnamon dark chocolate squares, salted caramel milk chocolate and plain dark chocolate that I had received as a gift during the holidays. The quail eggs are from a local grocer who sells them for $2.99 for 18, which is very reasonable. You can even use the egg from the blown out eggs for the cake. Three quail eggs yield about 2 ounces of egg or equal 1 medium chicken egg. This really is easy to make, but requires some planning ahead to make the filled eggs. 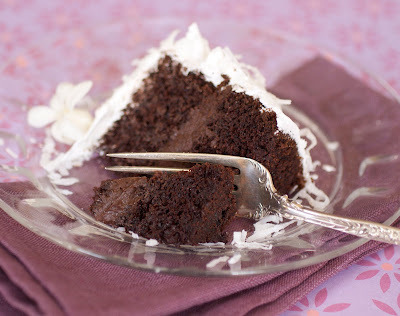 This cake and frosting are my little black dress of cakes.....both are low fat (except for the ganache) and elegant with just the right amount of sweetness. 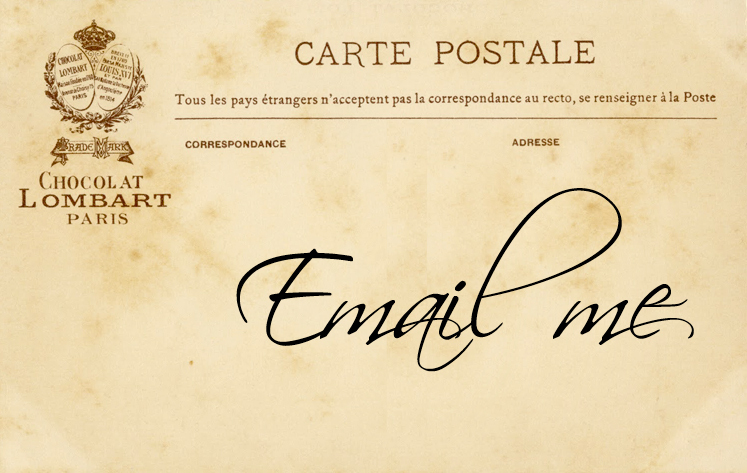 I use them often with different adornments. Happy Spring....the season of rebirth. For the tutorial for hollowing and filling the eggs, click here. This recipe is for 2-9 inch layer pans or 30 cupcakes. I made half of the recipe for a 2 layer 6 inch cake. Preheat oven to 350 degrees. Grease, flour and line with parchment 2 9-inch cake pans or line a muffin tin with cupcake baking cups. Combine dry ingredients in a large bowl. Add eggs, milk, oil, and vanilla; beat on medium speed for 2 minutes. Stir in boiling water (batter will be thin). Pour into prepared 9-inch cake pans or lined muffin tin. Bake 30-35 minutes for cake and 20-25 minutes for cupcakes or until wooden toothpick inserted in center comes out clean. Cool on a wire rack. Makes 30 cupcakes or 2 9 inch layer cakes. Break up the chocolate into a medium bowl. Heat the cream until just boiling and pour over the chocolate. Let it sit until the chocolate is melted. Stir to combine evenly and stir in the vanilla and almond extract. Let sit at room temperature until thick and creamy, but not too firm to spread. Combine the sugar and water in a heavy medium saucepan and bring to a boil without stirring. Boil until it reaches the soft ball stage, 240 degrees on a candy thermometer. While the syrup is cooking, beat the egg whites with the salt and cream of tartar until stiff peaks form. When the syrup reaches 240 degrees, pour 1/4 cup of the syrup into the stiffly beaten egg whites, drop by drop, beating at high speed. Gradually add the rest of the syrup in a fine stream and beat for 8 to 12 minutes, or until the mixture is cool. Beat in vanilla extract. The mixture should be glossy and thick, but not dry. Place one layer of the cake on a serving platter. Spread an even layer of the ganache on top. Place the second layer on and frost with the meringue frosting. 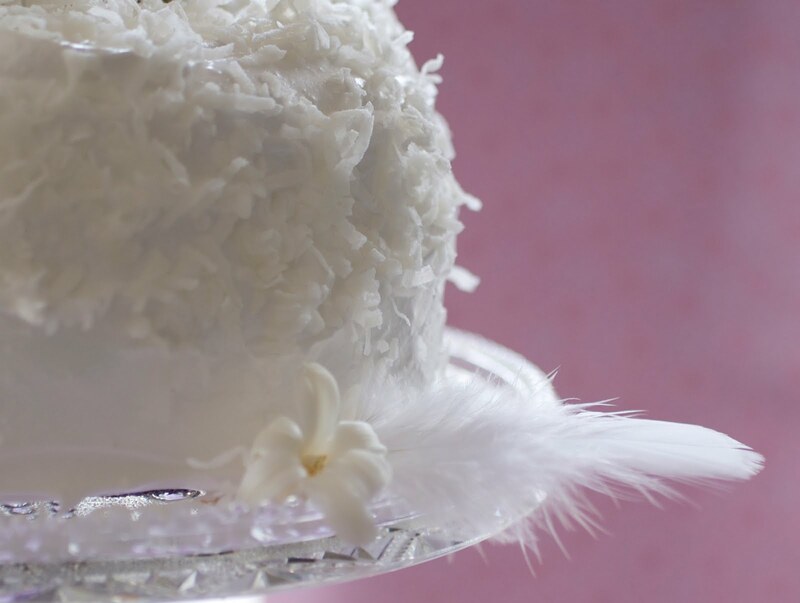 Sprinkle the shredded coconut on top and lightly pat on the sides. Chocolate Cake recipe, click here. Meringue Frosting With Coconut recipe, click here. Almond Ganache recipe, click here. Chocolate Filled Eggs tutorial, click here. Very elegant and delicious! I fall back on this Hershey's recipe often. The quail eggs are a lovely contrast. Nice shots and nice cake! well done. 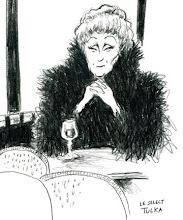 You are so attentive to detail.Kudos..Martha worthy. You need some little chicks like Mary has.. :)I wanted some but Jacques asked if I was crazy. 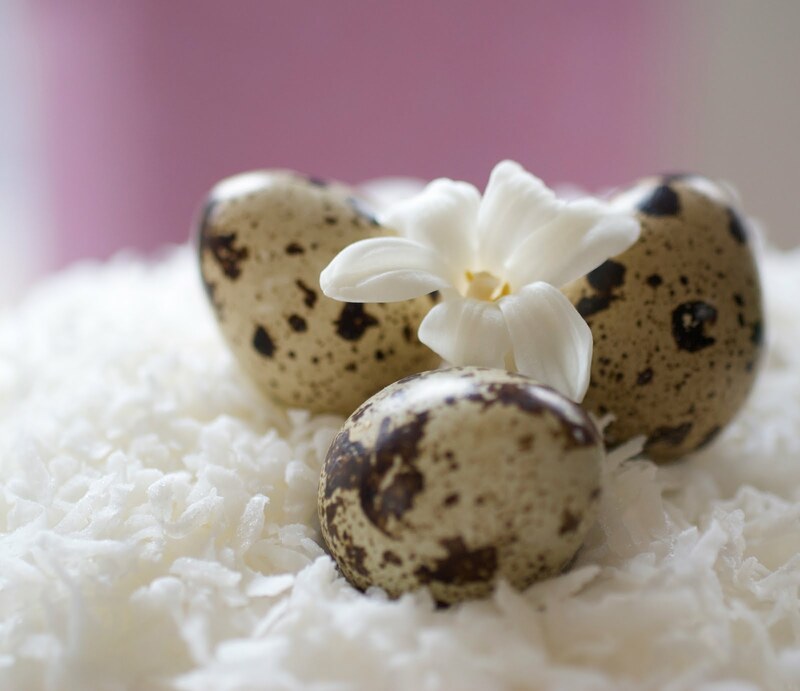 Diane, I'd never have the patience to do those eggs but the whole dessert is sheer magic... the photos are breathtaking too... really cheered up my day with all that light~~ like heaven! Wow, that is one absolutely beautiful cake, a nd great pictures! What a lovely cake!! The eggs look great, too. The Hershey's cake is my favorite recipe for chocolate cake. I love the aesthetic appeal (and taste, of course!) of chocolate cake with vanilla icing. This is so beautifully presented, especially with the coconut on the outside! That is so beautiful and I loved the chocolate filled eggs! What an amazing technique! All of your photos really do justice to this delicious cake. This is the prettiest cake I have ever seen!! love the little eggs! Oh I soooo want a piece of this cake! Such an elegant cake. 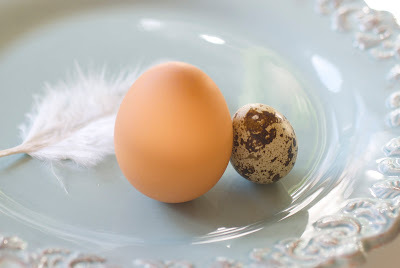 I love the quail eggs, they are the perfect size. I made chocolate chicken eggs in the past, but they really are too much chocolate(I can't believe I said that). Beautiful photos. Lovely cake! The quail eggs are a surprise topping. Elegant! I must try making this cake...maybe for Father's Day. I know the Kitchen Gnome will love it! Diane, you do it every time! I'm *SWOONING*. Almost too pretty to eat! You have outdone yourself Diane, which is hard to do! This is my favorite kind of cake (chocolate and coconut) and the filled eggs are simply beyond. I am in awe! The chocolate filled eggs are amazing! Beautiful, delicious and so so refined and elegant! I absolutely love it! the quail eggs are it! Your cake looks like something from a Martha Stewart magazine. Classy and gorgeous. I am sure it tastes heavenly as well! Thanks for all of the wonderful comments...they mean a lot. I hope you enjoy the cake and the chocolate filled eggs as much as we did here! That is one heavenly cake! Now I'm drooling! Great beautiful photos, I love the one with the feather on the plate and I have a plate just like it. Now I need the feather and eggs! That is so adorable for Easter! I went to your tutorial...must have been difficult to do the quail eggs! Your presentation with the feathers and the eggs is just so pretty. And the cake looks delicious! have a wonderful holiday diane! 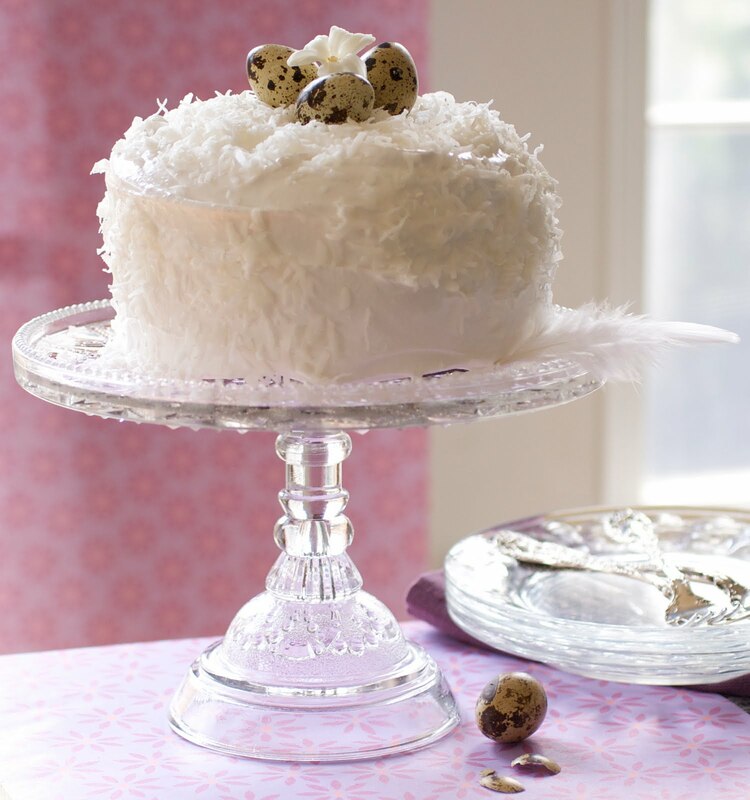 The cake looks so delicious...but with the chocolate filled quail eggs...WOW!!! wow! Quail eggs...veri innovative indeed....I am very impressed. Thanks to all and Happy Easter!